I am a fan of some of the Shepherd Neame beers and recently Lidl started to sell their beers for €2 as well as Leffe & Hoegaarden in 750ml bottles for €2.99 which is also excellent value. Needless to say I stocked up. 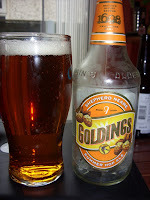 Among the Shepherd Neame bottles was a beer called Goldings which I had not tried before. As the name suggests, it is hopped with Goldings hops grown locally which since the brewery is in Kent, means East Kent Goldings of course. This is a summer ale and I have to say I love it. The aroma is very floral and fruity. The taste is equally hoppy as well as pacled full of citrus and it seems peppery to me also. It is very crisp and a real thirst quencher. It also packs a nice white fluffy head and has a very nice cider like carbonation. I wish they did not use clear glass so the risk of bad beer is reduced and also so I could re use the bottles but it is clear why they use clear glass as the colour and look of their beers is fantastic. Tomorrow I go back to the UK, this time to the lake district to spend a couple of nights at Daves brewpub/hotel called The Woolpack Inn. bit pricy that matey, ales 2 for £3 in Sainsburys and Leffe 2 for £5 in Tesco. Oh of course it is pricey by UK standards, alcohol is incredibly expensive here (Ireland)along with most other things come to think of it but €2 for a 500ml bottle of English ale is a bargain. Usually it would be closer to €3 and perhaps €3.50 depending on where you go. The Tale Of The Ale: Lidl now sells some nice english beers.